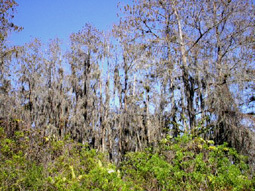 All the Cypress Trees were covered with air plants, bromeliads, and spanish moss. 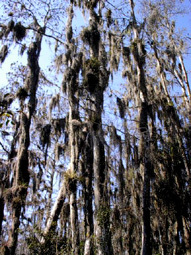 The trees are estimated to be over 65 years old! 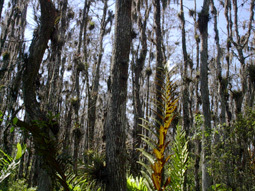 Here is a closer look at the air plants on the trees. 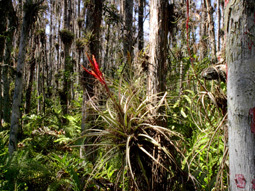 The Quill Leaf is a relative of the pineapple plant. 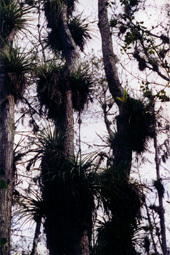 Epiphytes like these live on trees but do not harm the trees. They get nourishment from rain water and the moisture in the air. 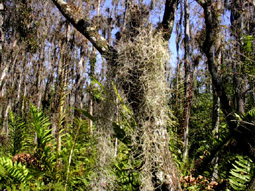 Spanish Moss covered almost every tree in the trail ! This airplant has no roots and absorbs nutrients through its' scales.